I can't harvest a beautiful, ripe red tomato from the garden without thinking of Caprese Salad- the wonderful summer dish of fresh tomato, fresh basil, and fresh mozzarella. 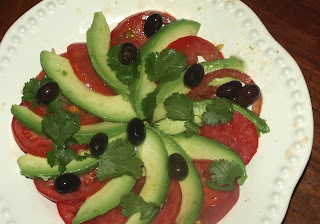 Since the fresh mozzarella is out, I tried to think of what else has a creamy texture and goes well with tomatoes.... Once I had the avocado and tomato combo, it seemed only natural to give it a more Mexican feel. This is a bit unorthodox, but it is delicous! Slice the tomatoes and avocados, and then arrange them on a plate in a circle, alternating tomato with avocado. Drizzle generously with olive oil, then sprinkle with cilantro and olives. Salt to taste. I often have a tomato, avocado, shrimp "salad" or tomato, avocado and eggs for breakfast. I love the tomato avocado combo.